India is home to around 20 odd protected areas, whose main objective is to conserve the population of the beautiful red pandas. These protected areas in majority are found in the states of Sikkim, West Bengal and Arunachal Pradesh. The red pandas, like most other wildlife species, face the threat of being wiped out due to the large scale extraction of fuel wood from the forests. This is leading to large scale deforestation of the bamboo jungles, and unlike grasslands they take a much longer time to grow back. The bamboo trees are the natural habitats of the red pandas. The red pandas tend to sleep all-day and wake up at dusk to grab something to munch on until the sun goes down. They later wake up at dawn again, eat and go back to sleep till dusk. The animal has a very low-calorie diet due to which they do little more than eat and sleep. Similar to the giant panda, the red panda too cannot digest cellulose; hence, it needs to consume large quantities of bamboo to survive. They also survive on small mammals, insects, flowers and berries. The three major national parks which are well known for the red panda population are the Khangchendzonga National Park, Neora Valley National Park and the Singalila National Park. The national park is located in the undiscovered terrains of the Kalimpong Hills which is house to untouched natural forests, along with dense bamboo groves. The Neora Valley, hence, provides shelter to many endangered species which are well protected in this area. The national park is connected to the Pangolakha Wildlife Sanctuary which is another natural habitat of the red panda. For one to reach the national park, you will have to first reach Lava, which is located about 34 km from Kalimpong. From here you need to take a jeep ride for almost an hour to reach the national par. You will also need to procure a permit from the forest department officials at Lava to enter the park. The national park is one amongst the highest biosphere reserves around the globe. The national park is not only home to several endangered animals, but also has several popular trekking trails. The Green Lake Pass, the the trials to Goecha La and many more pass through this national park. 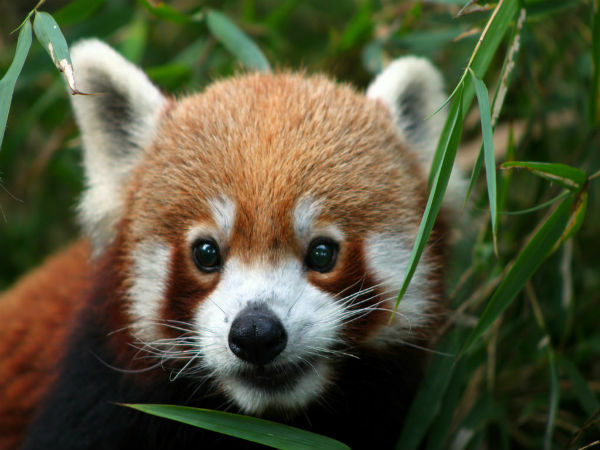 The park is located at the center of the Eastern Himalayan bamboo belt and is home to a sizable number of red pandas. The nearest airport is at Bagdogra and the nearest railway station is Siliguri Junction which is located about 221 km away from here. An entry fee of INR 200 is collected from Indians and INR 400 for foreign nationals. Singalila National Park was home to the highest density of red pandas in India but lost many to a major forest fire which broke out in March 2006. After which only about 25 odd species are left in the area. After the forest fire, Project Red Panda was reintroduced which concentrated on captive breeding in the wild. The park finds itself on the popular trekking trail to Sandakphi from Phalut. The nearest rail head is Ghoom which is around 31 km from Tonglu. The nearest airport is Bagdogra, one needs to get an entry permit from Manebhajan which is located at a very short distance from Tumling. The permits costs INR 100 for Indians and INR 200 for foreign nationals. Other Places To Spot Them? Apart from these three national parks, the red panda can also be spotted at some other wildlife sanctuaries such as the Barsey Rhododendron Sanctuary, the Eagle Nest Wildlife Sanctuary, the Pangolakha Wildlife Sanctuary and Maenam Wildlife Sanctuary. The red pandas are very small in number which makes it slightly difficult to spot them in the wild, but there are hopes of bringing about a change in this condition in the future.